So I was recently in Nashville for the wedding of two good friends. 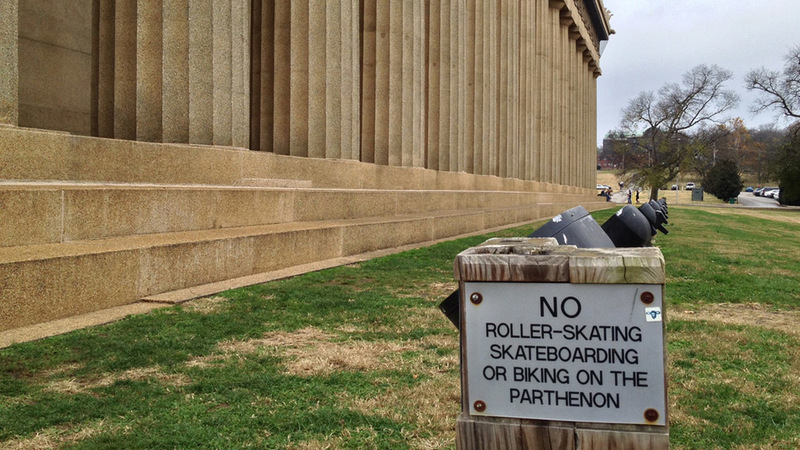 Nashville, as you may know, was considered the "Athens of the South" and so when the city played host to the 1897 Tennessee Centennial Exposition they naturally built a full-scale replica of the Parthenon in Athens just to reiterate that point. Like buildings at other fairs at the time, the Nashville Parthenon was originally built as a temporary structure of wood and staff. And like the Palace of Fine Arts in San Francisco and the Museum of Science and Industry in Chicago, it was later reconstructed in concrete to become a permanent part of the city. The details appear to be remarkably accurate including the subtle curvature of the entasis of the columns and stylobate - two terms I have not used since the final exam of my Architectural History Survey I course in college. Ultimately, architecture is something that must be experienced in place. Sure you can look at photographs and study drawings to understand the concept of a building, but there are subtleties of material, scale and siting that are only discoverable when the actual building is visited. The grandeur of St. Peter's, for example, can't be comprehended until you visit Rome. Constructing a full-scale mock-up is really the only way to simulate the experience of a building but this normally isn't worth the trouble. What makes the reconstructed Parthenon in Nashville interesting is that unlike the ruined original in Athens, this structure exists in its original condition. And so visitors to it are transported both in place and in time. The materials may be off and the people milling about the structure may be wearing t-shirts as opposed to chitons, but it's much easier to imagine what it was like on the Acropolis 2,400 years ago than by merely looking at a picture in a book. Architecture has the innate power to move the individuals who experience it. There was a time when this power was playfully deployed to transport to different locations and different times much like films do today. This power is one that architects should remember today.